Here’s the difference the length of school closures can make on an influenza epidemic in Allegheny County. In this model, schools are set to close after 10 kids get sick. The graphics shown here plot how various inflammatory mediators interact differently among patient groups with different outcomes. Pitt researchers explored likely outcomes if Medicaid were to lift the 30-day waiting period it mandates for female sterilizations. A bug goes viral. Inside each unlucky person who takes ill, organs send messenger proteins to one another in crosstalk to fend off infection. Within each of these organs, cells download and duplicate the virus. And all the while, both the cells and the viruses swap data among themselves, gather input from their environments, put it all together, and—most importantly—learn from it. It’s reprogram yourself or die. We biological beings are, at every level, a feedback loop on a mission—an intelligent system. Imagine you want to build a model of a biological process. It’s a little bit like perfecting a cake recipe. Say you have 20 ingredients you’re considering using. To decide how each variable contributes to the final product, you could go the trial-and-error route, baking Bundt cake after Bundt cake and omitting one ingredient each time. To try changing any two ingredients, you’d have to bake 190 cakes. To change any three, you’d need 1,140. Any four would take 4,845. Or, you could feed all the ingredients into a computer, explaining everything you know about how they interact with one another based on your experience. You could model thousands of what-ifs, coming up with a shortlist of possible recipes—then just bake and taste-test the ones least likely to flop. In medicine, the “ingredients” for a model might be insights gleaned from the literature, clinical experience, lab experiments, historical records of epidemics, and other data—or some such combination thereof. Researchers run a simulation and check their in silico results, as those in the field like to call them, then analyze them for patterns that will inform their “recipe.” Then, they gather more data as needed to fine-tune the model and fill in any gaps. Once the model proves viable, they can tweak the dials and test the what-ifs. It’s an approach that works well in all sorts of applications—biomedical device development, disease progression prediction, and so on—and it’s holding increasingly more promise as Big Data grows bigger. Imagine the possibilities with that bug we started with. You could model the molecular process of how it infects cells, duplicates, and spreads throughout the body. You could model disease vectors. (Pitt people have already modeled dengue fever outbreaks at the level of individual mosquitoes.) Take it a few steps further, and you could model how resistance emerges after patients drop various treatments. Drug resistance might then grow to become a population-wide problem. You could model that, too. In his field, epidemiologist Don Burke, an MD and Pitt Distinguished University Professor of Health Science and Policy as well as professor of medicine, was an early adopter of modeling. His first simulation, which he published in Nature in 2004, identified previously unrecognized patterns in Thailand’s dengue fever epidemic. He went on to publish similar epidemic analyses for the United States and Central Africa. Following the Sept. 11, 2001 attacks, he designed a smallpox-outbreak model that directly informed U.S. vaccination policy for biodefense preparedness. By “it all,” he meant build a single, centralized, open-source database of all infectious disease cases, everywhere. For as far back as the records go. What if we closed schools during an influenza outbreak? What if employers offered more paid sick days? Diseases interact with their environment and can’t be understood in a vacuum. Like the people who carry them, their reactions differ from scenario to scenario. They’re dynamic. 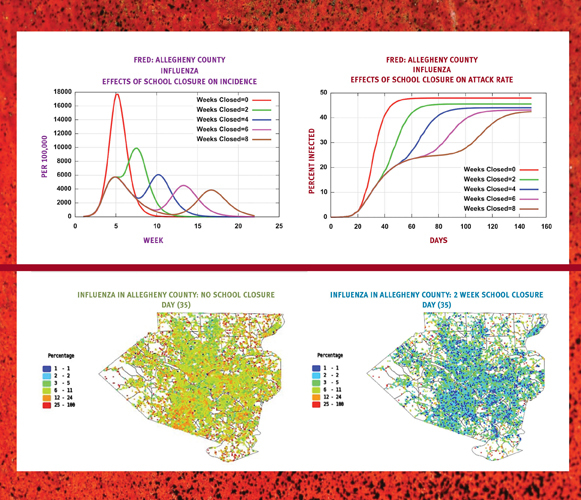 A new modeling platform called FRED—Framework for Reconstructing Epidemiological Dynamics (the acronym honors Fred Rogers)—allows researchers to chart the paths of epidemics and the effects of mitigation strategies, viral evolution, and personal health behavior. “We’re trying to tie together things that happen inside human beings and, essentially, the population impact of interventions,” says John Grefenstette, a PhD professor of biostatistics in Pitt Public Health and director of the Public Health Dynamics Laboratory at Pitt. The tool takes into account the personalities of different places—for instance, an older Pittsburgh population versus a younger Salt Lake City. “Our policies are going to have locally different effects,” says Grefenstette. What if that trial failed because we didn’t give the drug to the right patients? When physicians talk about sepsis, a word they might use to describe it is cascade. But the image that comes to mind for these docs is probably not a gentle waterfall. The physiological response that is sepsis can be every bit as catastrophic as a tsunami. And patient outcomes are all over the map—one severely injured patient who ends up with sepsis (a systemic inflammation tied to infections) can do far better than another with more moderate injuries, for example. The rhyme or reason of it all has eluded scientists. In the late ’90s, a few research groups thought sepsis might respond to a TNF-targeting drug as a possible treatment. TNF (a.k.a., tumor necrosis factor) has been used for decades as a sepsis biomarker, a blood test that signals to physicians when the tide is rising. The drug seemed promising at the outset—animal and preliminary human-trial results were encouraging. But a phase III clinical trial was a dud; it had mixed results. Though many patients benefited, many others were harmed. Frustrated by these and other dead ends in this confounding condition, Yoram Vodovotz, PhD professor of surgery, Gilles Clermont, MD associate professor of critical care medicine, and mathematician Carson Chow—all of the University of Pittsburgh—hatched a plan for a new approach: to build the first in silico model of severe sepsis. Colleagues told them they were crazy. Sepsis is just too complicated to simulate, they said. But that, Vodovotz recalls, was exactly the point. After reviewing the literature, the team chose biological parameters that appeared to be important in sepsis: the duration of the precipitating infection or injury, the patient’s blood pressure, and the level of dysfunction in patient tissues, among others. 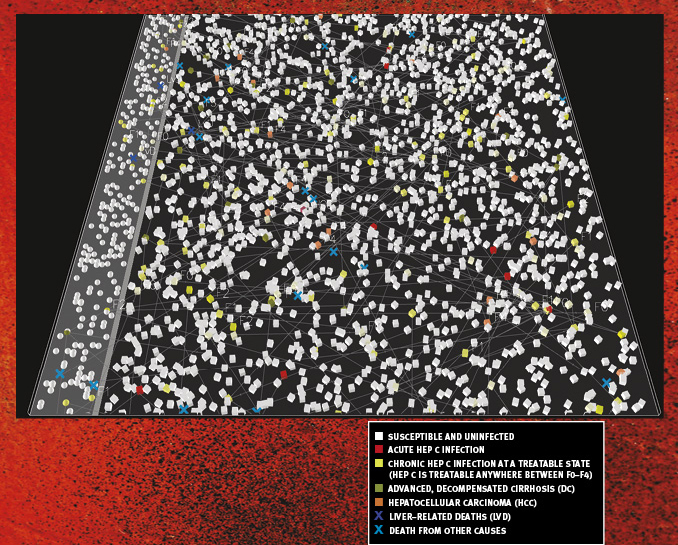 Using algorithms designed by Chow, they ran the simulations and watched the resulting changes in endotoxin, cytokine, and other protein levels in the hours, days, and weeks after injury. Vodovotz then validated the model by comparing the simulation results to those of his own follow-up studies of cellular processes in the lab. Then the team ran the simulation again. It’s all about relationships, he says. Instead of focusing on the individual players themselves—the various inflammatory markers and whatever molecular processes might be at work within and among them—first look for patterns in how the players affect one another over time: A inhibits B and C, B inhibits C and A, and so on. That makes the time you spend in the lab much more focused and efficient. In 2004, the team put their model to the test by re-running the failed anti-TNF-drug study in silico—and found comparable results in their simulated patients. The silver lining in all this bad news was that the Pitt study proved that modeling sepsis was an idea that could hold water. And unlike with clinical or laboratory trials, simulated sepsis could be rewound, paused for further pondering, and even altered. Scientists could ask important questions, like: Why was the drug good for some people and bad for others? What separates the two groups of patients? Their findings are nonlinear. So, in the case of sepsis, yes, high TNF levels are a bad sign, but that doesn’t necessarily mean that low TNF is a good thing. Inflammation is more complicated than that—but not unfathomable, says Vodovotz. What if we held off on that transplant? When a patient receives a new liver, not only is she married to a physiologically taxing regimen of immunosuppressants forever, but she’s also opening up a daunting new set of what-ifs: What if the transplant doesn’t help? What if that organ could have saved the life of someone else on the transplant list? Mark Roberts—MD professor and chair of health policy and management in Pitt’s Graduate School of Public Health and professor of medicine, of industrial engineering, and of clinical and translational science—has been wrestling with these questions for more than a decade. Once recovered, donated livers have a shelf life of 18 hours, tops. In his systematic what-iffing, Roberts has shown that more organs might be transplanted—and more lives saved—in time if the regional map for organ allocation were redrawn, among other findings. Recently, Roberts teamed up with a Pitt group—including Yoram Vodovotz, of surgery—that’s exploring another ethical conundrum in transplant medicine, one that arises in cases of pediatric acute liver failure (PALF). This devastating condition can result from poisoning, acetaminophen overdose, infection, or—as is the case with almost half of these kids—for reasons that are never discovered. PALF can take a child from perfect health to the ICU in a matter of weeks, or even days. Without a liver transplant, many will die. And, for reasons no one can explain, many others won’t. Sometimes, a child is put on the transplant list, seemingly at death’s door, and then makes a full recovery before a match for an organ can be found. Which raises a delicate question: Are we doing too many transplants? And the short answer, says Vodovotz, is, Yes. 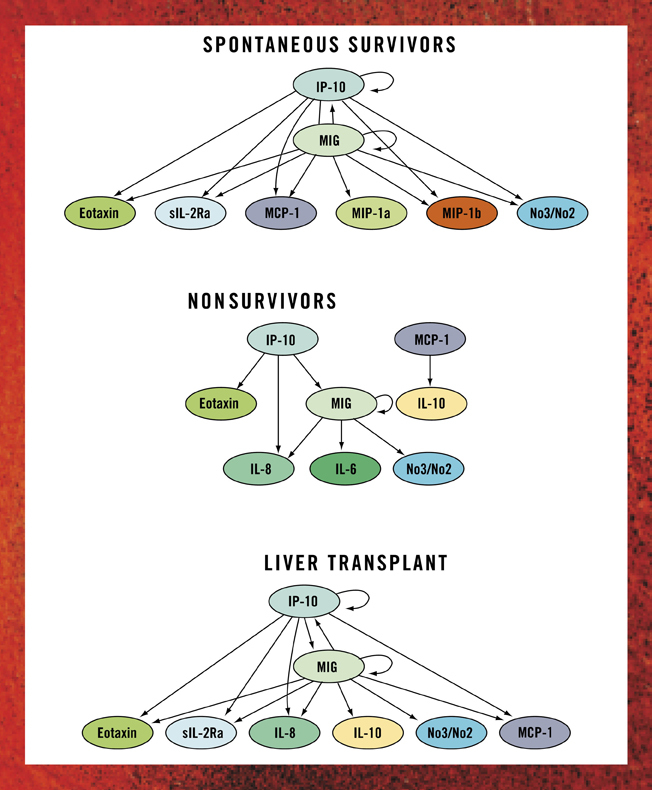 After comparing the inflammatory networks of the patient groups, the team arrived at an intriguing finding: The progression of protein interplay seen in the bloodwork of survivors with native livers and that of the transplant recipients (post-transplant) look markedly similar (see graphics below). Vodovotz explains that taking blood samples to check for levels of inflammatory mediators has never been helpful in predicting which children could survive without a transplant. But the team found that after drawing blood each day, watching how these levels change, and analyzing how these mediators influence one another over time, a new picture emerged. “If you look at the network representation, which says how mediators are interplaying with one another, it’s a night-and-day difference. You could easily tell the groups apart,” he says. The study was published last November in PLOS ONE. Vodovotz and Roberts have started a new model: thousands of virtual boys and girls with PALF, each with his or her own virtual physiology and each facing the decision of whether to get on to the virtual liver-transplant waiting list. What if Medicaid lifted the 30-day waiting period mandated for female sterilizations? Female sterilization is the second most common contraceptive in the United States, even though Medicaid patients who elect to have the procedure are subjected to a 30-day waiting period. In a study published in the journal Contraception and discussed in a recent New England Journal of Medicine editorial, Pitt’s Sonya Borrero and Kenneth Smith, both MDs in the Department of Medicine, with collaborators, explored what would happen if policymakers were to revise that rule. Women often request to have their “tubes tied” (tubal ligation) while in the hospital after giving birth. The researchers knew, anecdotally, that the mandate could make scheduling the procedure difficult. Patients with private insurance have no such waiting period imposed on them. So, what if the mandated month-long lag between the request and procedure didn’t exist? After building a model, known as a cost-effectiveness decision analysis, based on real Medicaid data (see image below), the team concluded that fulfilled sterilization requests would increase by 45 percent. Here’s how the analysis works. All women who request sterilization under Medicaid enter the model. The model then simulates potential outcomes over the course of one year. Researchers can compare what happens with the current policy against a parallel Medicaid universe, which simulates outcomes with an imagined revised-policy branch of the model. Under a revised policy, the probability of women actually receiving the procedure increases with the 30-day barrier removed. Smith says that, annually, such an increase could prevent more than 29,000 unintended pregnancies and save the Medicaid program $215 million by avoiding the costs of childbirth from such pregnancies. The Medicaid rules also require that women sign a consent form. Yet “assessments of the form’s readability indicate that it is overly complicated, and its literacy level is too high for the average American adult,” Borrero and coauthors write in the NEJM. In a related study, a Borrero team found that 34 percent of the women who read the form did not realize that a tubal ligation was permanent, and many did not realize there were reversible alternatives. Any new policy should have more readable documents to ensure that patients understand their options, the researchers say. Borrero et al. point out that it is important to be sensitive to the idea that the fertility of the poor seems to be less valued by society. In fact, the Department of Health, Education, and Welfare first established a waiting period in 1976 after numerous troubling reports from that time: Poor women were being pressured into sterilization as part of local or state family planning programs. Health care providers sometimes suggested that welfare and other benefits were tied to sterilization and often didn’t get proper patient consents. Some women are still vulnerable, Borrero notes, pointing out that serious questions have been raised about the sterilizations of 150 women in California prisons between 2006 and 2010. What if we screened inmates for hep C? More than 3 million people in the United States are infected with hepatitis C, a leading cause of chronic liver disease. Between 50 and 75 percent of them don’t even know they have it. Hep C is often transmitted intravenously. And prisons nationwide—with hep C prevalence documented at rates as high as 35 percent, though no standard screening protocols exist—have become a hotbed for the disease, says Jagpreet Chhatwal, a PhD assistant professor at the M.D. Anderson Cancer Center in Houston. While he was an assistant professor of health and policy management and of industrial engineering at Pitt two years ago, Chhatwal teamed up with Pitt’s Mark Roberts, MD professor of medicine, Pitt’s John Grefenstette, a PhD and director of the Public Health Dynamics Laboratory, and Tianhua He from Tsinghua University in China. They started developing a model that would answer some questions about hep C: What if prisons routinely screened all inmates for hep C and then treated those found to be infected? What would be the cost? What would be the benefits to society at large? “If we can model the prison system, we can predict the disease impact on intervening while everyone is still inside,” Chhatwal says. Many inmates are released unaware they even have hep C.
Using Bureau of Justice statistics, the investigators developed an “agent-based” model (see “Special Agents”) to simulate people moving between prisons and society and the spread of hep C. “Imagine you’re looking at a video game with individuals moving in and out of the [prison] system with certain disease characteristics,” Chhatwal says. The model takes into account variables like disease stage, an individual’s behavior, access to treatment, and whether a person is aware of the infection. What if we used this new vaccine instead of the old one? Pitt’s Kenneth Smith, an MD and professor of medicine, wondered: Is the new pneumococcal vaccine better than the old? And for whom? These vaccines are designed to ward off bacterial pneumonia, bloodstream infections, meningitis, and other infections. Published in the Journal of the American Medical Association in February 2012, their paper concluded that the new 13-valent pneumococcal conjugate vaccine (PCV13) makes the most economic and health sense for patients over the age of 50, regardless of their medical condition. More than a decade ago, Gilles Clermont, MD associate professor of critical care medicine at Pitt, cofounded Immunetrics—a computational modeling software company that’s turned what-iffing into a viable Pittsburgh-based biotech enterprise. Immunetrics is now chugging along without him. More recently, he’s been exploring ways to use modeling, machine-learning, and other data-driven technology in new smart gadgets in health care. An artificial pancreas system that maintains desired blood sugar levels in critically ill patients. An alert system to help physicians flag possible medical errors at the bedside. A hospital “air traffic controller” on the lookout for ways to keep patient flow humming along smoothly. A 15-minute health “forecast” system to give critical care docs a heads-up on which patients are headed for trouble—so the physicians can steer them clear of the storm. “The more data we have, the more tools we’re going to need to cast it—to reinforce, destroy, or remodel our conceptual framework of how the world works,” says Clermont. 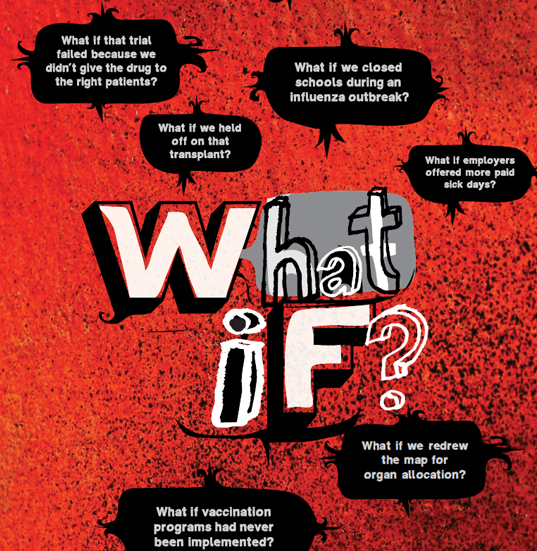 “A What-If Generator” charts courtesy BMC Public Health. 2013 Oct 8;13:940. DOI: 10.1186/1471-2458-13-940. Heat maps courtesy PHDL. “Model Patients” Graphic by Michael Lotenero, adapted from Azhar N. et al. (2013), “Aanalysis of serum inflammatory mediators indentiFies unique dynamic networks associated with death and spontaneous survival in pediatric acute liver failure,” PLOS ONE 8(11): e78202. doi:10.1371/journal.pone.0078202. 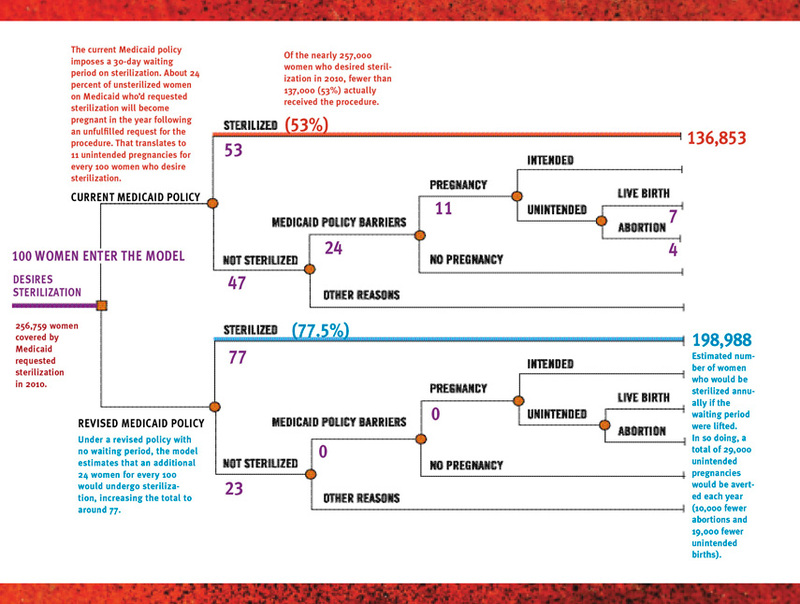 “A Month’s Difference” graph Reprinted from Contraception, 88/6, Borrero et al, “Potential unintended pregnancies averted and cost savings associated with a revised Medicaid sterilization policy,” 691–696, Copyright (2013), with permission from Elsevier. “Thinking Inside and Out” graphic courtesy Jagpreet Chhatwal.